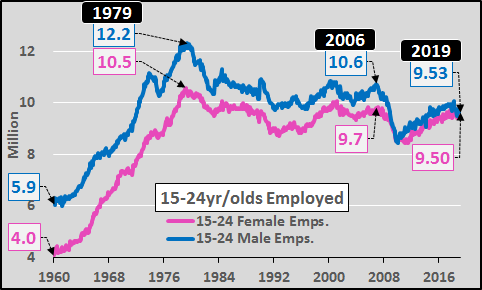 I recently detailed why a recession is imminent based on a few factors, chiefly full employment among the working age segments of the population and minimal population growth among the same segments, detailed HERE. 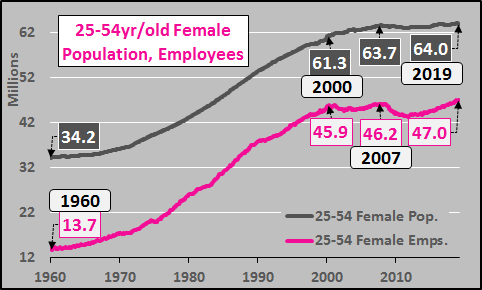 However, today I wanted to outline the impact that women moving into the labor force had on growing the labor force, but why this growth has ceased. 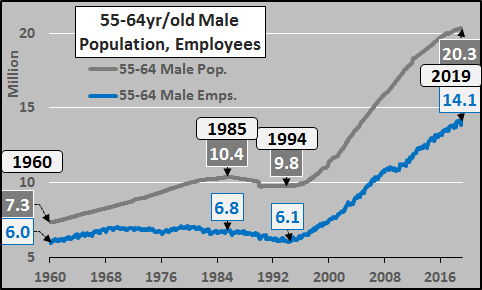 I’ll also point out that the 2008-’09 financial crisis was a demographically driven crisis that was set decades earlier. 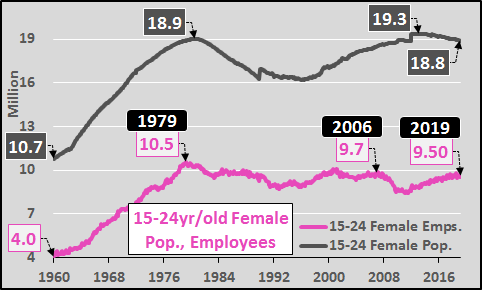 The chart below shows 15 to 24 year old employed males and females, from 1960 to present. 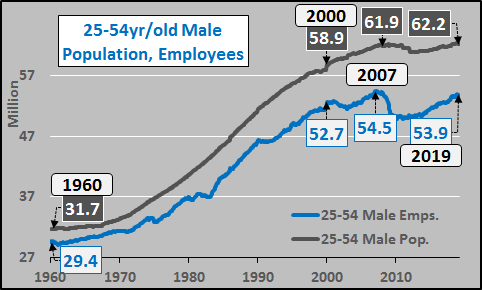 Based on the peak 15 to 24 employment in 1979 (and subsequent four decades of decline), there was always sure to be a like peak (and like fall) among the 25 to 54 year old core population 30 years later…or 2009. 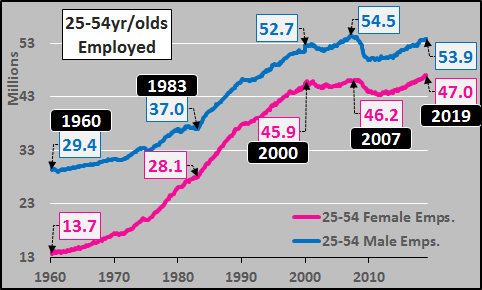 Noteworthy is the relatively larger decline in employment among males than among females…and the fact that men and women make equal parts of the total employed persons. 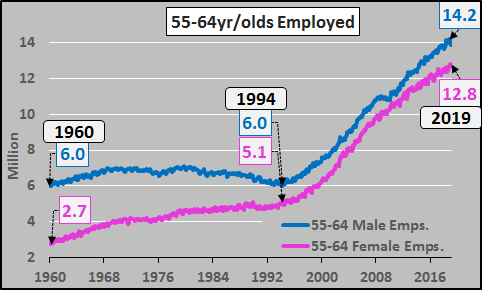 55 to 64 year old male and female employed percentages charted below. 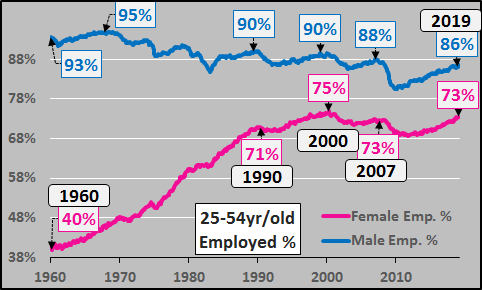 The decline in the percentage of males employed to 1994 and slight rise since. 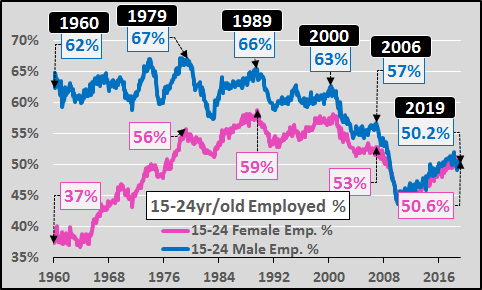 The percentage of 55 to 64 females employed consistently rose from ’60 to ’08, but like the percentage of males employed, appears to have hit peak employment since ’08. 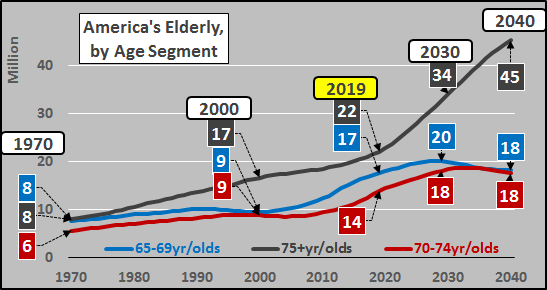 That tell-tale baby-boom population surge is now heading into the 75+ year old population segment (grey line below)…a group that has an 8% labor force participation rate. 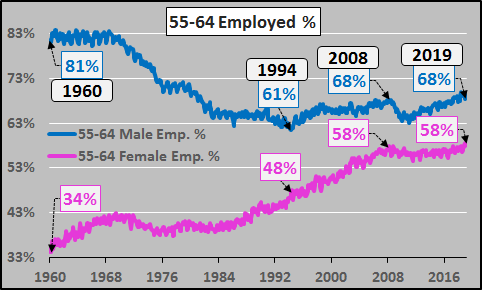 Even the 65 to 74 year old labor force participation rate is just 27%. 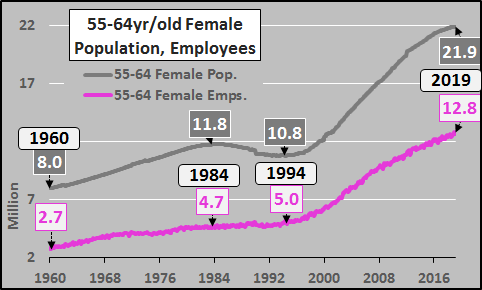 Elderly population growth does not equate to employment or economic growth. 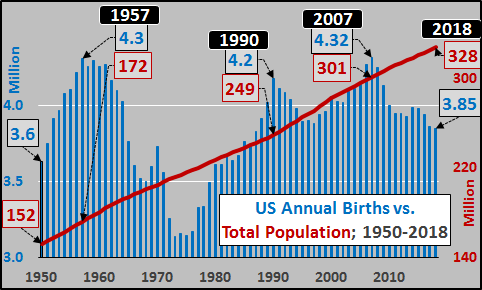 And finally, a juxtaposition of no rise (net) in births for five decades, (and now nearly a half million annual decline in births since 2007), versus a near doubling in total population. 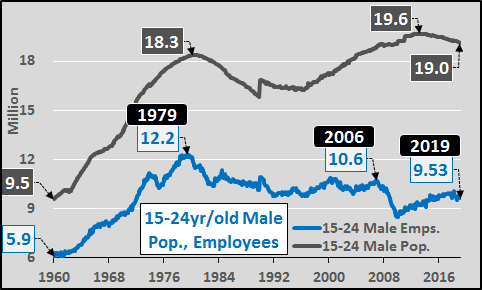 Big details, like the lack of working age population growth, subsequent employment growth, and resultant economic growth…can be hidden in big numbers.